Make this pretty Candy Rose Jewellery Set with shining glass pearls and a gold plated findings kit! Cut 2 lengths of beading wire measuring approx. 30" each. Take one of your wires and thread on your pearl beads in your desired pattern. We graduated their size and colour along the necklace! Do the same with your second length of wire and add a few less beads so that the strand is shorter. To make the necklace neat where the strands join together, add 3 or 4 small gold plated round beads onto your longer, outer strand of pearls. This will stagger the two threads so that they sit correctly. Repeat this on the other side of the necklace. Once you are happy the strands will fall correctly, choose one side of the necklace and thread both wires through a crimp bead. Thread through a securely closed jumpring and back through the crimp bead. This will hold the jumpring in place. Thread the wires down into your beadwork to hide the tails. Crush the crimp bead to secure the wires in place. Repeat this method on the other side of the necklace. 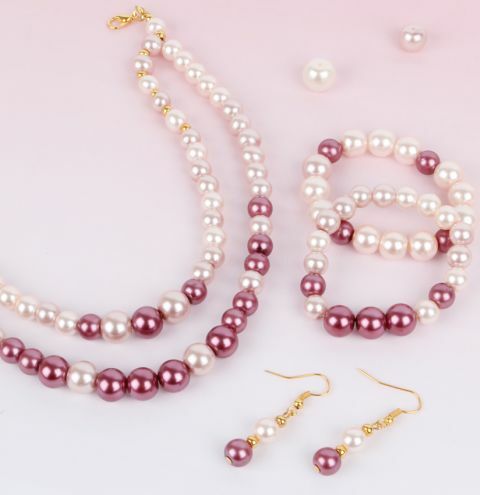 This will take a little more as you will have to pay attention to make sure there are no gaps inbetween the pearls on your necklace before your secure your crimp bead. Finally add more jumprings or an extension chain to make your necklace longer and adjustable. Attach your lobster clasp to the other side of your necklace. Take a length of elastic measuring approx 15"
You may wish to secure your knots with a drop of glue or some clear nailpolish. Once you are happy your knot is secure, trim your tail cords approx. 3-5mm away from the knot. Take a headpin and thread on your chosen beads. Trim your headpin down to 1cm above the top bead and turn a loop using round nose pliers. Open the loop on your earwire and attach to your headpin. Close the loop securely. Repeat this for the other earring.